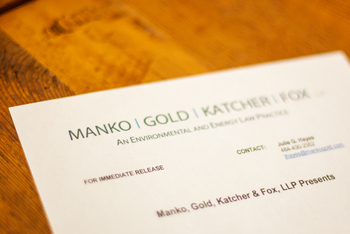 Philadelphia, PA (April 11, 2013) – Michael C. Gross, a partner with Manko, Gold, Katcher & Fox, LLP (MGKF), the environmental, energy and land use law firm based in Bala Cynwyd, PA, will be a panelist on a webinar on Monday, May 13, 2013 from 2 to 3 p.m. EDT. It is entitled, “Vapor Intrusion – Legal Concerns, Risk Management, and Scientific Factors for Attorneys and their Clients” on behalf of the American Law Institute. Read the ful press release here.